Automatic duct forming line "Ducter"
Plasma cutting system "Sprint Cutter"
Automatic duct forming machine is used to work with the coil metal with width up to 1500 mm and weighting up to 8 tons. Locker is designed to automate the production process and increase the assembly of straight sections of rectangular air-ducts. 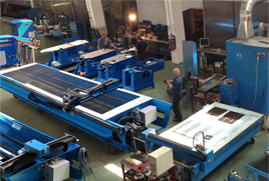 Plasma cutting machine with a special HVAC software, includes libraries of round, rectangular and oval duct fittings. The machine series SeamMaster FP with seven rollforming stations is a multi-functional machine for varying uses in the HVAC ducting industry. The advanced StandingFlanger facilitates the production process of small radius cheeks due to a series of options. Z-profiling of the material is applied mainly in HVAC and some other industries where there is a need to stiffen the sheet metal to avoid vibration. The machine "DuctFolder" is designed for closing of Pittsburg lock, when rectangular air ducts are manufactured or for radius closing of the Pittsburg lock when bends are manufactured. Pneumatic hand tools RS15- 19 is specially designed for the production of rectangular ducts , silencers , duct fans , bag filters , etc.